You're not the only one worried about your brand new AirPods falling out of your ears during the morning jog - Apple has been thinking a lot about it too, as a patent recently published at Patently Apple shows. The patent, which was filed back in the first half of the year, shows a strap that fits around the back of your ear to keep the AirPods in place. The two ends are also magnetically attracted to each other, making it even less likely that the earbuds will jump out of place. While the patent does show an AirPod-style device in one of the diagrams, there's also mention of a wired set of headphones, so this is a mechanism that Apple is thinking about for its whole audio line (which now includes Beats of course). Whether this was an early plan for the AirPods that eventually got shelved, or whether Apple wants to add this magnetic strap to future editions of the earbuds, isn't clear. As with all patents, there's no guarantee Apple will actually implement any of this. Still, it's reassuring to see some options being explored. Based on the testing we've done, AirPods falling out isn't really a problem, although they don't exactly feel secure either. 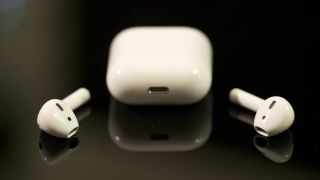 The new wireless earphones do seem to be a hit with users, though Apple hasn't released official sales figures: reports over the weekend from China hint that the firm manufacturing the AirPods is expanding capacity in order to keep up with demand.